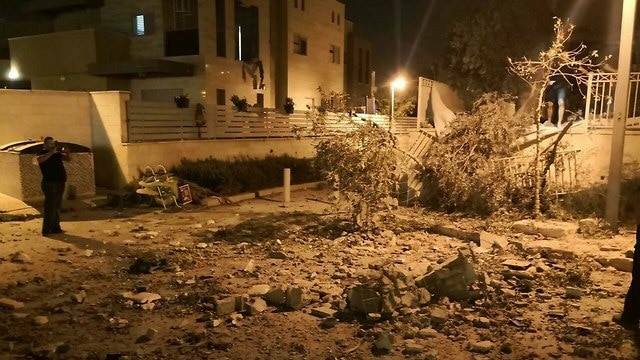 For the first time in months, a Grad rocket was fired from Gaza at around 4 am on Wednesday, hitting the yard of a house in the city of Beersheba, causing no injuries or damage. Various Palestinian armed resistance movements rejected responsibility for the rocket. It is worth mentioning that both Hamas and the Islamic Jihad issued similar statement denying responsibility for firing the missile, and also said that the “rockets are only meant to sabotage and foil the indirect talks, mediated by Egypt. The resistance has restrained its fighters from firing rockets toward Israel since the weekly Great March of Return non-violent protests at the border of Gaza began on March 30th, 2018. The rocket fired Wednesday morning was one of two fired at around the same time, according to the Israeli military. The second rocket ended up falling into the sea. When the rocket was airborne, the Israeli alarm system sounded and Israeli residents of the city entered shelters set up for that purpose. The Iron Dome missile defense system, which Israel set up with U.S. funding to fire air-to-air missiles at any rockets fired from Gaza, did not activate. Israeli Defense Minister, Avigdor Lieberman, decided to close all border terminals in Gaza, and to impose further reductions on the fishing zone. On Wednesday morning, the Israeli Air Force fired several missiles at many areas in the Gaza Strip, wounding 14 Palestinians, including six schoolchildren in Deir al-Balah, in central Gaza. The wounded were rushed to the Al-Aqsa Hospital.